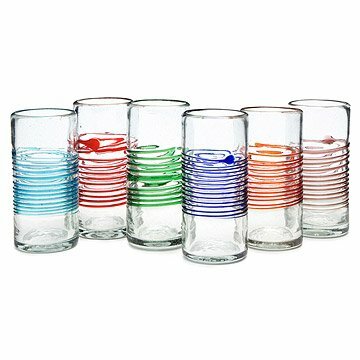 Bring vibrant color to the table with these highball glasses, mouth blown by Mexican glass artisans. This appealing set of glassware rides the line between contemporary design old-fashioned craftsmanship. Each piece is mouth blown using recycled glass, and decorated with a line of brilliant color coiled tightly around their middles. The set of six colors is beautiful whether in use or on display, and helps to distinguish guests' drinks when entertaining. Handmade in Mexico. Tucked away in the Spanish-colonial style streets of San Miguel de Allende, Mexico, artist Alfredo Garcia-Lucio works with Mexican craftsmen to create his one-of-a-kind designs. He began his creative journey in Denver, Colorado, where he worked as a photographer and designer in print, fabric, and space design. Since then, he’s moved his operation to San Miguel de Allende, where his sustainable designs made of recycled materials can most authentically embody his Mexican heritage as well as the artisanal traditions commonly used there. I drink liquids with them. If possible could you all make a matching pitcher for the striped water colored glassware. Daily use, like them overall some of the colored glass around the sides was slightly cracked, not very noticeable. Very attractive. They also look like they should hold up well. I loved the look and feel of these glasses. The openings are a bit narrow. My problem was with the decorative striping. My first order arrived with a shattered glass. I called and was immediately shipped a new set (great customer service). However, while waiting for the new set, I examined the unbroken glasses to find that two of them had areas in the striping that were kind of broken and rough. It was as if the artist did not use quality glass (I've done some glass blowing), or they allowed the strand to become too fine. When the second set arrived, it too had some glasses with rough areas in the striping. By this time, I had lost confidence in the glasses and decided I was not comfortable using them with guests. So I returned the glasses. I wish the result was better. I liked that there are variations within the glass. But I didn't feel the quality was there. Even though the website states Not Dishwasher Safe we've put them in the dishwasher several times and so far no problems. Everyone likes them! We love these glasses! The different colors help us keep track of whose glass it is. The center stripes also help with gripping the glass. These glasses are made of solid glass and are not fragile. Just what I was looking for -- attractive drinking glasses that aren't cookie cutter and aren't fragile. Not too thick, not too thin. The stripes also make holding the glass easier. A hit with my family.